PowerDirector is a feature packed post-production studio from CyerLink-the company behind many popular and well-acclaimed multimedia software. With a unique combination of powerful editing tools and high-end performance, it will help you to produce amazing videos with minimum effort. It caters everything you need to handle each phases of filmmaking. The PowerDirector 15 is the most recent iteration of this software and it comes with plenty of highly customizable design and editing tools. It is available in four versions viz. Ultra, Ultimate, Ultimate Suite and Director Suite. The features and price varies from version to version. PowerDirector 15 Ultra is the least expensive version, but it offers everything you need to make the movie of your dreams. 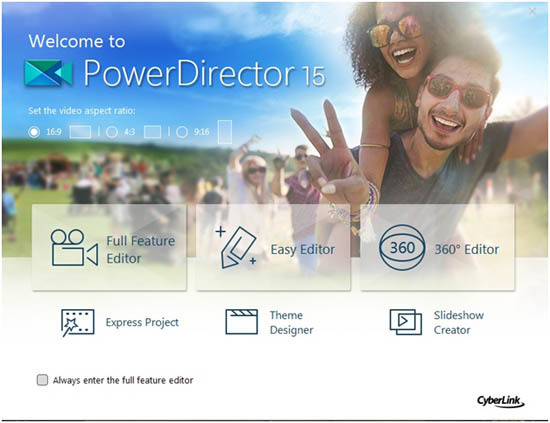 The attractive new and improved features that make PowerDirector 15 distinct from the competitors include. 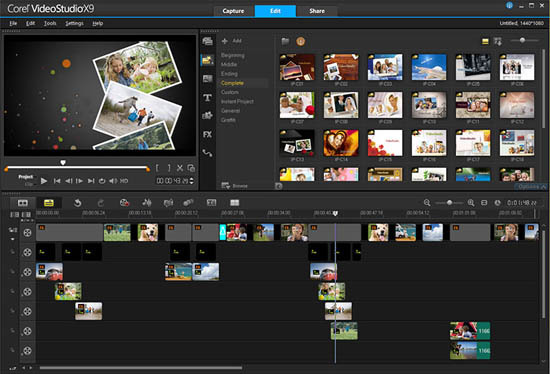 It is one of the most intuitive video editors available today. Despite the huge number for tools in the PowerDirector 15, its interface is remarkably clear and user-friendly, and you do not need to be a Hollywood professional to make the best out of it. It let the beginners to learn the basics of video editing while the advanced users can do their job quickly and more easily. PowerDirector 15 provides three options to create your movie. If you are a seasoned pro, you can choose the full feature editor that comes with the popular timeline and storyboard layout. If you are not experienced to jump into that option right away, you can go for the simplified editor and it will automatically create your video in just a couple of minutes. In addition, the Magic Movie Wizard in Easy Editor will help you to make a finished video in a very few steps. Just load the raw clips, select background music and pick the style, the PowerDirector with its Magic Style algorithm, analyze the clips and automatically arrange them to form a well-edited movie. Express Project is a simple way to make high quality movies instantly. The module includes many preprogrammed templates, which can be filled with your video clips to make a beautiful movie in no time. Open the Express Projects menu and import your clips, rearrange them in the order they are intended to play using drag and drop, and hit Produce to make your movie. You can also share them instantly on any social media platforms. This is a new feature available in PowerDirector 15 Ultra. It comes with a complete set of tools that enable you to create, edit and share immersive 360� projects from equirectangular footages. 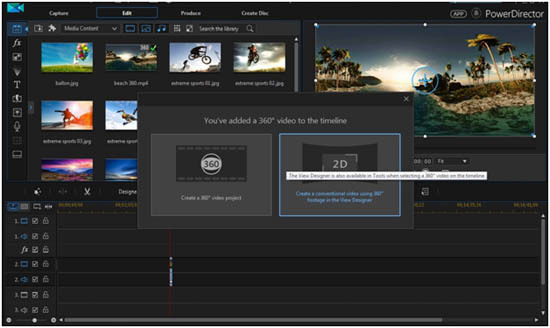 It features full 360� Video Editing tool kit to trim, combine and add titles, animated particle effects and transitions to the clippings and export them in 360� Video format. The new True360 View Designer allow you to walk through the 360� videos and extract any particular sequence so that you can include it in a standard video project. Moreover, with this tool, you can play 360� Video format in standard video projectors and the scene will look like it have been filmed using multiple cameras put at different angels. Another attraction in the PowerDirector 15 is the Action Camera module that can be used to correct the fish eye effect that is most common with the wide angle cameras used to shoot 360� footage. Video editor suits are available in plenty, but only a few can challenge PowerDirector 15 Ultra for features, performance and price. Corel VideoStudio Pro X9.5 is one of them that can compete with PowerDirector head to head. It is another powerful video editing software developed by Corel. VideoStudio is definitely one of the most stable, features packed video editor, and offers something for editors of all levels to tell their story in their own ways. It comes with everything you need to make an outstanding movie instantly, including simple instant projects templates to the most advanced timeline/storyboard combination editing tools. It allows you to choose the workflow that is perfect for your skill level and the complexity of your project. It hosts a bunch of customizable design components such as alpha transitions, particle and PiP objects, animated titles etc. In addition, hundreds of special effects, transitions, titles, and multi-camera editor are also available in it to spice up your movie, and that too in an easy to use interface. The Pro X 9.5 version incorporates unique MyDVD Templates, revamped Audio controls and balancing, Multi-point Motion Tracking, HEVC support and Multi-Camera Video Editor with four cameras support to make your movie unique and eye-catching. Working with Corel VisualStudio Pro X 9.5 is quite simple. Just drag and drop your footage, the comprehensive set of tools will allow you control the whole thing including the keyframe and audio. You can cut, trim, split, modify, fix/enhance, edit lighting and color, and stabilize the shaky footage in this software effortlessly. It also offers many bonus materials including Screen Capture, FastFlick, VideoStudio MyDVD etc and there is no need to look for any plugins or addons for VisualStudio.